How to plane your power boat better! Let me grieve about my pet peeve, mushing. I could start an educational campaign - perhaps "The Society for Proper Power Boat Planing." By "mushing" I mean driving a fully-planing-hull power boat at semi-planing speeds. worst of all makes a huge and unnecessary wake. Thousands of boaters seem unaware of any this, much to the consternation of the many people they disturb unnecessarily as they pass by. A previous boat of mine, Stella B., had a "mushing" rpm range of from about 1400 to 2800 - a very large band on the tachometer! But with rare exceptions, I simply did not operate the engine in this zone. That meant I was going either 7 knots or 18, and although sometimes the speeds in the middle might have been useful, I eschewed them (and I eschewed them good!). Yes, this confers significant limitations upon the prudent boat operator, but as I say in Boat Docking, "the laws of physics are more stubborn than you are," so get over it and operate your boat properly!! My expertise does not lie in the area of naval architecture nor of boat design, so please consider this a personal view, and feel free to educate me when I err. some hulls are built for semi-planing, which they do better than fully planing hulls, but still with some limitations. the constant 1.34 for length in feet or 2.43 in metres. The crew may find the trip so relaxing, however, and the skipper find the vessel so miserly with fuel, that a fourteen-hour run leaves them all refreshed and ready (with energy and money!) to hit the night-clubs in port - a very different experience than in a planing hull boat! In fact, speaking of fuel-efficiency, even displacement hulls do much better at slower speeds, and so they rarely make long passages at hull speed. By dropping a knot or three off their speed, reducing their constants from 1.34 to 1.1 (in feet) or from 2.43 to 1.9 (in metres), let's say, they can often double or triple their fuel-efficiency. Now, we have slowed our 12-metre boat down to the 5.5 knot range, and are having a great time on the water but not getting anywhere in a great hurry. Hull speed is intimately related to and caused by the waves made by the hull - those waves being the "wake," of course. As a hull is propelled through the water, it makes a wake (actually, several of them, different types - but for now let's just consider the bow wake). The formulas dictating hull speed are actually about wave-length - and at hull speed, the second in the series of waves called the bow wake is at the boat's stern. The middle of the boat is sitting in the trough, between the two waves. At slower speeds, the second wave is further forward along the boat's hull, and the hull may sit on two or three waves, bridging across their crests and troughs. But, at hull speed and now applying more power, the second wave moves behind the boat, so the hull no longer sits in the middle of the trough - it finds itself rather on the back of its own bow wave, stern squatting and bow rising, trying desperately to climb a perpetual slope in front of itself. This is the engine-straining, noisy, poor-visibility, fuel-inefficient situation referred to earlier. In a hull which will not plane, there's really no point to it. One exception to the "hull speed" limitation in displacement hull boats may be in vessels with very fine entries. This gives the bow but little flotation, and it can slice through its bow wave, rather than try to float over top of it. Some multi-hull boats are like this, apparently. Furthermore, if you do try to overpower a displacement hull, let's say by towing it behind a powerful, planing-hull boat, you still can't make it do much more than hull speed. If you try, usually you end up breaking things: cleats pull out, lines break, etc. But if not, the towed boat may sink, either through settling deeper in the water (the counter-intuitive venturi effect of faster and faster water rushing by its curved underbelly), or by riding so bow-high that the stern submerges and the boat then founders. Why will a full-displacement hull not plane? It's not designed to, is why not. The kind of rounded aft-section of the bottom, rising gently and slopingly from the water - that's a displacement hull. You know what we mean by "displacement" - the hull displaces its own weight in water, as do all floating objects, but is not the right shape to rise up and plane or skip over the water with the application of more power. The exact details of the underwater hull shape have intrigued boat designers since the very early days of boat building. The most efficient hulls, meaning they will move through the water at greatest (displacement) speed for the least propulsive effort, generally disturb the water as little as possible and make very small wakes. There is no way to make it make no wake, and there are many other design considerations (such as handling in a following sea, room for interior accommodations, etc.) which often require a compromise in hull form, so you won't often see hull efficiency as the only design consideration. And so you'll notice, in the real world, that some displacement hulls make smaller wakes than others - but at least we hope this was done intentionally, gaining something else at the expense of extra fuel consumption and wave making. Planing hulls require a different hull shape and huge amounts of power. The underwater section is flat (if viewed from the side), not curved like a displacement hull. At speed, a planing hull acts on the water's surface like an inclined plane, in some ways like "skipping" over the water. The flat hull bottom ends abruptly at a transom, with which it makes a very sharp angle. There is no resemblance here to a displacement hull boat's rounded bottom and gentle emergence from the water. This means that when "on plane," the transom is out of the water - in other words, the water breaks away cleanly from the boat's flat, planing bottom. This also means that when not on plane, the transom is under water, but obviously not very efficiently shaped. Notice the swirling, irregular, "boiling" water behind a planing hull, when it's moving slowly and off plane, and you just know that the boat is wasting a lot of energy stirring all that water around aimlessly. The "transom water" is also at lower pressure than the "stiller" water around it, so creates a strong suction (and yes, I know that there is no such thing as suction, in physics), holding the boat back. Most inefficient. That's one reason that, if you examine the fuel-mileage curves for planing hull boats, they generally do worse at displacement speeds than at planing speeds. Pretty well the only speed which gives them the same or better efficiency as planing is bare idle speed - even a little bit faster, and their mileage drops off dramatically. This is not to say that planing hull boats are efficient on plane. It takes a tremendous amount of energy to hold them partly out of the water like that. (One example I know illustrates an almost ten-to-one advantage of a displacement hull over a planing hull, in terms of fuel-consumption per unit mass.) It's just that their terrible fuel-inefficiency is even worse below full-planing speeds. semi-planing (or semi-displacing) - phase one planing - mushing! This phenomenon is recognized easily by most planing-hull power boaters. As you ease the throttles forward (you don't jam them suddenly forward, do you? - try to be gentle with your boat and its passengers), the bow rises higher and higher, you open the throttle more and the bow goes higher still, and there is a great deal of engine noise, gigantic wakes (and I'll come back to that!) and then finally, as the boat gains speed, the bow falls partly back down, closer to a level position, the engine and boat speeds pick up more freely with less strain. Often you prefer at this stage to ease back on the throttle a bit and not let the boat run away on you! What has happened is that you've made the transition from semi-planing (water breaking away at transom but not yet over your own bow wave) to full planing (bow wave behind you). It's exactly like an airplane breaking the sound barrier, only different. Now, as only a rough generalization, it's the semi-planing speeds which are bad. That's where the huge wakes are. However, some authorities calculate full planing speeds using something like the formula presented earlier for deducing hull speed, but increasing the constant to 3.5 or 4.0 (using feet, not metres). So, our boat with a 25 foot water-line length has to go 20 knots to plane fully, but probably semi-planes from about 10 knots on up. That's a large range of unusable speeds. In fact, you'll be kicking up some pretty good waves even before you reach 10 knots. I do literally mean "unusable," too. I could make exceptions, such as for when you're towing a tuber and need to limit your speed (or intentionally give them the largest wake possible, for fun! ), or when matching your boat speed to heavy weather conditions, in which case your wake is not likely anybody else's biggest problem anymore anyway. But for the most part, in a planing hull boat, either go slowly enough that you're not significantly raising the bow (and I can't say exactly what that means on your boat, but watch your wake and listen to the engine, and you'll know), or get right up and plane fully. The prohibited speed range isn't as bad as it sounds, because at the really bow-high, smack-in-the-middle semi-planing speed, you won't be happy anyway. It just doesn't feel right. Very few people cruise at this speed, and I join you in shaking my head in disbelief and disapproval at the few who do. The more common culprit is the just below or just into semi-planing speed. These can sneak up on a boater. For example, let's say you're leaving the marina, and have a ways to go until you're in clear, open water. Once even a little way out from fixed objects ashore, your speed of 5 knots seems like a crawl (it's not - you're getting somewhere, and will be there faster than you think), so you ease the throttles a little further forward a few times, and before you know it you're in the 10 knot range, at which speed all of the vices of semi-planing, such as straining, noisy engines, are still somewhat muted - even though you're already throwing an unacceptable and discourteous wake. But hearken unto this observation a friend of mine made under just those circumstances. He was travelling out of the harbour at displacement speeds, having his crew tidy lines and fenders, while some distance abeam of him another boater was doing similarly except semi-planing, bow high, engines roaring, forward visibility dangerously impaired, making big waves. On the several-minutes sojourn to the main channel, they stayed exactly abeam of each other - in other words, all that the dysfunctional semi-planer was doing with all that unnecessary power was holding his boat on the backside of its own bow wave, with virtually no increase in speed. He probably felt as if he were going faster - it does feel like that in that situation, but it's largely illusory. boating is extraordinarily enjoyable without drugs! a high proportion of boating mishaps involve alcohol. And no I'm not a teatotaller. But I won't have my one or two drinks until the day's boating is over and I'm safely secured to a dock - even at anchor, you never know when a crisis will erupt and you'll have to be underway promptly, so I exercise great caution. On another occasion, a boater was leaving an impromptu anchorage where scores of us had settled to take in a concert just ashore of us, and then to watch a fireworks display. It was a lovely evening. But when it was over, in the dark, lots of tired people, some of whom might not have been entirely sober, one guy semi-planed out from amongst all the anchored boats. I have to believe that he did this out of ignorance, because he was only going a few hundred metres until he was clear of us, and probably gained only a few seconds by going that fast. The wake he threw as people were hauling anchor and repositioning passengers was more than impolite - it was also dangerous. I doubt if he could hear everyone yelling at him over the din of his engine. When you're in the semi-planing range, you're in it, for whatever reason. I know this sounds obvious, but one of several scenarios which can delude you is the transition from displacement to planing mode. In between times, you'll be semi-planing, and there's no avoiding it, so be careful where you do it! I've seen this many times, but to illustrate that I'm only human too, I did it again a few years ago, when I should have known better, under these circumstances: I was cruising along beside a friend of mine whose sailboat was under sail. We were chatting, but he was surreptiously crowding on sail, making those minutes adjustments sailboaters make to gain an extra fraction of a knot, and so he began to pull away from me. I was approaching hull speed anyway (in my planing hull power boat), but our conversation had reached its natural conclusion, and clearly we couldn't keep this up forever, so he gave me the throttle forward signal. (Despite being a very experienced boater himself, he clearly didn't know what was going to happen either.) So, I pushed the throttle forward, and sped away. Bumping into him a few days later ashore, his first comment was that he had seen boat wakes and rough weather many times before, but had never experienced anything like the rocking I had given him! I apologized, and we both learned something. As I made the transition from displacement to full planing modes, I had to spend some time going through the semi-planing speeds, and I did it 10 feet beside him! The only alternative course of action I can think of would have been to turn away from him and speed off at right angles. Pushing my speed another knot or two to pass parallel to him by the brute force method would also have created a huge wake, and would have taken a long time! So, there may be times when you think you can properly plane along, but not semi-plane, in terms of keeping your wake size reasonable. But be careful about where you accelerate - or decelerate - because you'll semi-plane during the transition to or from full planing, consternating those around you. Learn how to trim your outdrive and planing trim tabs, if you have either. In general, you can sometimes produce a smaller wake if you can keep your bow down, even if "artificially" through the use of these mechanical contrivences. No one has convinced me of one method of using trim tabs which surpasses all others. Some boaters get up on plane, and then lower their tabs to suit the conditions. I used to prefer to lower my tabs first, before pushing the throttle lever forward, and adjust them as the boat speed picked up, but in my current boat it seems to work better the other way around. The manual for my tabs, several boats ago ("Low Profile"), said to use the tabs to try to replicate the planing angle which occurred at full throttle with the tabs up (retracted - "bow up"). If you over-trim, and push the bow too far down, it won't feel right, and you'll know it. The bow throws too much spray, the sound changes, and the boat "bow steers" - it's hard to describe it, but you and the boat will be happier when you back off on the tabs a bit. If you're operating a straight-shaft inboard, then your trimming is pretty well done, but if you have an outboard or I/O ("inboard/outboard"), then you also trim your outdrive. This is more for propulsive efficiency than for better planing. The official line always seems to be to adjust your propeller shaft to a horizontal position, but in practice, speed-seekers often like to trim it further out, pointing the discharge current up as well as astern. Although you would think that this would raise the bow, once you're going fast enough the planing effect of the hull over-rides this, and for whatever reasons, once you're well into the fully planing speed range, trimming the outdrive out increases planing efficiency. Planing through big waves generally is smoother if you keep the bow down, using any of the several methods of boat trim described above. Beginner boaters going into waves often feel as if they should trim the bow high, sort of shying away from hitting the waves too hard - but the sharpest point of entry of the hull is generally the stem of the bow, and then as you go aft the V of the hull gradually (and only partly) flattens out. So, counter-intuitive though it may seem, if you find yourself banging down too hard over the waves, try trimming the bow down more. And, of course, slow down. 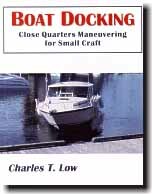 Some of the boating literature says that this applies more to head seas than to following seas. I'm sure that this varies by boat, but in any that I have operated in waves, the boat behaved as if in a head sea as long as it was overtaking the waves (whether the waves were going in the same direction as the boat or not). If we weren't overtaking the waves of a "following" sea, we were going slowly enough so as not to be on plane or to have much trim tab effect anyway. Common problem: you're the slow boat in a channel, sharing the space with planing power boats, some of whom wish to zip by you, but probably not really fast, so they're semi-planing and throwing a big wake. What, you ask yourself, could you possibly do about this yourself? Well, you can't do much about idiots, and there will always be some of those around. But some boaters really do want to disturb you as little as possible. However, if you're in a displacement boat under way at 7 knots, then somebody passing has to do 9, and we know from the earlier dissertation that this may be a large-wake speed for them. You don't have to like it - you just have to live with it. I am so very tired of hearing power boaters complain about sailboats "in their way." And I also grow weary of sailboaters who whine about every wake - even a "responsible" wake - which comes their way. You're on the water; that's the important thing. There are two broad classes of boats out there, and that's not about to change! Some boats are built to do this from the word go. That doesn't mean they won't throw big wakes - they often do, and demand close attention to that when near other boats (or sensitive shorelines, etc.) True commercial lobster boats are often like this, for example. With their heavy diesel engine amidships instead of right at the stern, and a modified planing hull form (probably longer bottom, flatter in transverse section, sometimes a softer chine than a full planing hull, fine entry with less buoyant bow, and I'm getting beyond myself here), they can ride on the back of their own bow wave without pointing their noses too high. These are excellent heavy-weather boats, owning some of the seakeeping qualities of full-displacement vessels, with the added advantage of moderate semi-planing speeds (requiring, however, large motors and not getting great fuel mileage). Larger recreational boats are often semi-planing too, and it certainly seems as if some of them do it better than others! By using the calculations above, you'll see that to fully plane the twelve metre boat I described earlier, it would have to go something like 22 knots - and that's not yet going to be a comfortable planing speed, which is often well beyond the minimum for full planing. No, boats that large often cruise in the 12 to 16 knot range - building them to go faster would require excessively large engines and impractical amounts of fuel. And more often than not, at their semi-planing cruising speed, they throw a considerable wake - perhaps not as much as if the designer had intended them as fully-planing vessels, but big enough to take it into account, so be very ready to slow way down if you think your wake exceeds the limits of sociability or safety. I think it's good to figure out about mushing early in your boating career. (Please do not fly a Power Squadron or Coast Guard Auxiliary flag unless you are prepared to boat responsibly and intelligently, and that does not mean mushing!) Thanks for letting me get this off my chest. PS You may want to read some related comments I wrote years ago in an article called Wake Management. The best reference I know for this is Oceanography and Seamanship by van Dorn, a big, hardcover book, very fascinating.